WE are often asked for assistance in creating a good looking and functional conference space. To try and help with this we have presented a quick shortlist on how to achieve this goal. 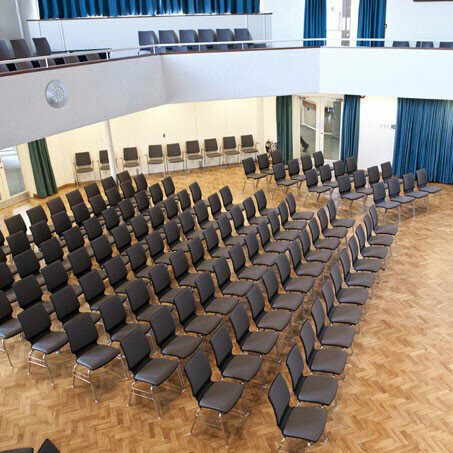 Shown below are some very real concerns that should be addressed when specifying seating for conference centres and auditoriums and some of our examples of where the advice has been followed. When the people watching a presentation are squirming in their seat and looking for an excuse to leave, they’re probably not gaining a lot from the presentation in front of them. If a conference organiser receives feedback from the attendees that this was the case, the organiser may need to reconsider their options next time around. Conferences are notorious for having quick turnarounds, especially when their breakout rooms are in use and the main conference hall needs to go from accommodating 300 people to 30 in the space of 10 minutes. Well-designed seating can accomplish this, with some systems having very fast integral linking systems to the frame of the chair such as with the Lynx and First ranges of seating. People come in different shapes and sizes and the seating needs to be comfortable regardless of whether you’re accommodating a heavyweight boxer or a petite glamour model. Being able to accommodate those with a disability is of paramount importance and as such seating needs this flexibility. Not only is this best practice, it’s required by the Disability Discrimination Act. This goes without saying, but safety is a primary concern. Having a seat fail mid-presentation is most certainly embarrassing but could also be the source of a legal claim if somebody is injured. Not to mention the bad publicity and feedback. You also need to buy seating that will last for financial reasons. What’s the point in saving £40 per chair if the chairs then only last 6-12 months? It’s better to buy product that will last the 10-15 years that it should. As a general rule of thumb, if you are going to have 50 seats or more then rows of 4 or more should be linked together to prevent the chairs toppling and blocking the escape of other occupants. A well designed seat with linking system will allow this. This is covered in more detail in “Planning Escape from Public Area & Regulatory Reform Fire Safety Order 2005”. However as it is a more complex issue we have now issued a guide on setting out seats in public areas, which can be found here. 6. Not as good as your competitors! You are in a competitive market. If your competition is using comfortable, sturdy, flexible and safe furniture that looks fantastic then your clients are more likely to choose them next time….or this time! We have many products to choose from including the Carver chair, 40/4 conference chair, Fox chair or the Lynx chair. We are sure to be able to find a product to fit your requirements.